This is table stakes, but it’s not enough to have an SSL certificate, it must be up to date. Think this will never happen to you? Even the biggest web properties have let them expire, which brings up nasty warnings that can send visitors fleeing, either by causing them fear or confusion. This post explains how you can check your SSL certificate’s expiration date and plan for renewal. 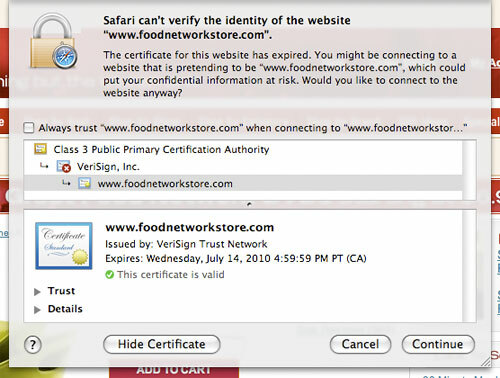 Security seals like Verisign, McAfee and TrustE are commonplace and you may ask if they have an impact on conversion or not, to which any ecommerce consultant would say “why don’t you test it?” A few years ago, a Get Elastic reader shared the results of his testing, a 4-6% lift using the seal vs. not. Others have reported similar upticks, but it’s not just about testing the presence of vs. absence of. Placement of the seals will impact the likelihood the customer will notice it. Often I see security seals buried in footer menus. Proximity to the call to action (point of anxiety) is important if you want to get the most bang for your buck with security badges. An alternative to the security seal is the lock icon on or near the call to action button. Lock symbols are universally recognized (perhaps more than security seal logos) and are free! I don’t see a problem using both security badges and lock icons, but at least one should be used. Labeling your button “Secure Checkout” also does not hurt. As I’ve written about before, the CVV field in checkout can be a cause of confusion and anxiety. Customers may not know where to locate the CVV (aka CSC, CVC, CVV2). Or, misunderstanding the purpose of CVV, they may believe providing you with their super-secret-code will mean their code could be misused by your employees or a security breach. Showing visually where the customer can locate the CVV and including a blurb assuring the code will not be stored in a database can curb this anxiety. Even if a customer does not wish to use your live chat or customer service during checkout, knowing you have real people that are quick and easy to access is a stress reliever. Make your callouts prominent, and list hours of operation and average expected wait times on your Help page. While it’s not your fault that customs decides to apply duties and taxes to shipments, customers may be angry at your shop (erroneously) and regret their purchase. Having clear information displayed for international shoppers (this could be displayed selectively based on shipping address or through IP detection) is a courtesy. Some sites use a global logistics service like FiftyOne to internationalize their sites, which will provide a “landed cost” that includes import duties and local taxes for no surprises. The acceptance of PayPal, BillMeLater, Google Checkout et al. are deal breakers for some customers, either because they don’t have a credit card, or because they are cautious to share banking information with online retailers. This is more important for lesser known brands, but knowing that you’re a legitimate business that discloses it’s head office location, etc. 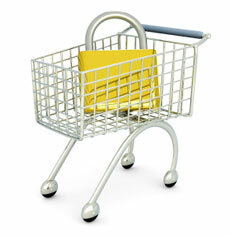 does boost confidence in shopping with you. I often have friends send me URLs of sites they wish to purchase from but are not sure are legit. When investigating, a physical address and phone number is the first thing I look for. These may seem like small things, but you want to do everything you can to win shoppers’ trust. If there’s anything missing from this list on your site, most of these items are simple (and inexpensive) fixes.